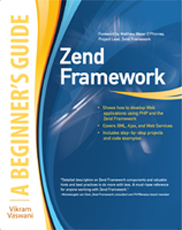 Zend Framework: A Beginner's Guide is intended for users who are new to the Zend Framework. It takes a close look at some of the Zend Framework's most important features - such as Model-View-Controller implementation, routing, input validation, internationalization, and caching - and shows the reader how to use them in a practical context. Written as a hands-on tutorial, Zend Framework: A Beginner's Guide also walks the reader through the process of building a complete Web application with the Zend Framework, starting with the basics and then adding in more complex features such as data pagination and sorting, user authentication, exception handling, localization, and Web services. Each chapter includes one or more practical projects that the reader can "follow along with" to gain a practical understanding of the material being discussed. Best practices and expert tips round out the material, ensuring that readers have all the information needed to begin developing robust applications with the Zend Framework. Zend Framework is focused on building more secure, reliable, and modern Web 2.0 applications and Web services, and consuming widely available APIs. In this book, you’ll learn how Zend Framework approaches these goals, from an author who is both well-versed in the subject as well as a capable and clear technical writer.